The 6-way PVC fittings on this page will fit sch 40, Sch 80, Class 200, Class 315, co-extruded furniture pipe and any other IPS size pvc pipe, plumbing grade or furniture grade. Check out the 5-way PVC pipe fittings if you are looking for less connectors for your project. If you want to use the 1/2" and 3/4" 6-way PVC connectors on this page (which are all referred to as IPS or Sch 40 fittings) with CTS (the cream color CPvC pipe) you can use CPVC CTS to PVC IPS adapters. 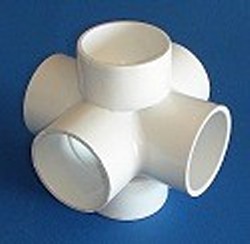 Some PVC pipe fittings are MADE IN THE USA and some are imported. 2" PVC 6 way (an outlet for all 3 planes, in all directions). This is a constructed fitting. Good for construction projects, not good for plumbing projects. Not a flow through fitting, not an NSF fitting. Custom made part. This is a fabricated fitting, no cancellations, no returns. Ground orders please allow 2-3 extra days for processing. If you need it in a hurry, please use one of the expedited shipping options on the check out page. We will try our best to get it out asap, but large orders may see a 1-2 day delay.